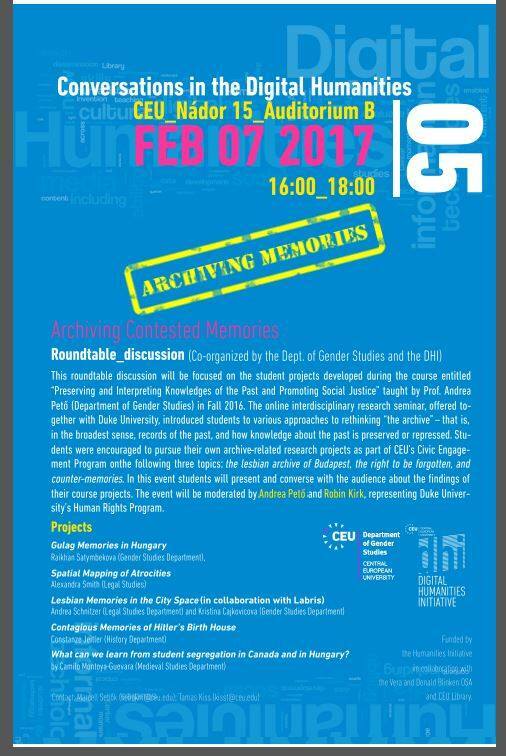 Join us on February 7th to learn more about archiving contested memories. This is the 6th event in the Conversations in the Digital Humanities series. Presentations of Ally Smith, Raikhan Satymbekova, Camilo Mg and other students from last semester's interdisciplinary seminar "Preserving and Interpreting Knowledges of the Past and Promoting Social Justice" taught by professors Andrea Peto from CEU and Robin Kirk from Duke. This roundtable discussion will be focused on the student projects developed during the course entitled “Preserving and Interpreting Knowledges of the Past and Promoting Social Justice” taught by Prof. Andrea Peto (Department of Gender Studies) in Fall 2016. The online interdisciplinary research seminar, offered together with Duke University, introduced students to various approaches to rethinking “the archive” – that is, in the broadest sense, records of the past, and how knowledge about the past is preserved or repressed. Students were encouraged to pursue their own archive-related research projects as part of CEU’s Civic Engagement Program on the following three topics: the lesbian archive of Budapest, the right to be forgotten, and counter-memories. In this event students will present and converse with the audience about the findings of their course projects. The event will be moderated by Andrea Pető and Robin Kirk, representing Duke University’s Human Rights Program.